The joint contact force can be broken down further into the joint contact pressure distribution and the ligament tension using the graphical models (Fig. 4). The bones of the joint are treated as rigid bodies. The articular cartilage within the joint is treated as a matrix of linear compressive springs, and the ligaments are treated as linear tensile springs to quantify the joint contact pressure distribution and the ligament tension [3,20,35]. 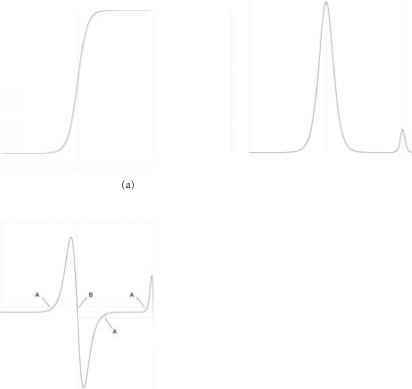 This analysis technique is known as discrete element analysis. The discrete element analysis method requires dramatically less computational time than finite element analysis techniques, but has been shown to provide similar contact pressure distribution measurements . 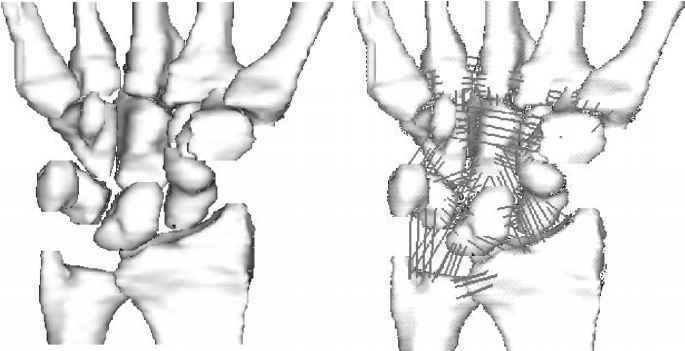 FIGURE 4 A computational model of the wrist used for discrete element analysis of the joint contact pressure and ligament tension. 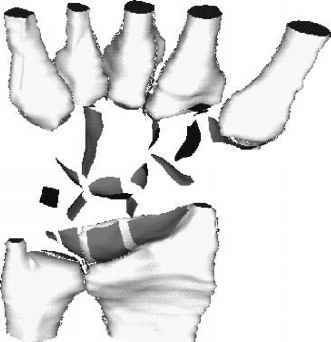 A CT scan of a cadaver wrist was used to create each bone segment (a). The ligaments of the wrist were modeled with tensile springs (b). Compressive springs were distributed along the contact surfaces between the bones (c) to quantify the joint contact pressure. See also Plate 35.
iterative basis until equilibrium is reached. For each polygon element on the bone surface, the spring force and the polygon area determine the applied pressure. These equations give a system of n equations with n unknowns to quantify the deformation of each spring (¿). In these equations, K represents the spring stiffness matrix (including both tensile and compressive springs). R represents the vector of applied forces and moments acting at the centroids of the rigid bodies. U represents the displacement vector (both translations and rotations) for the rigid body centroids. The shear forces within the joint are not included in this set of equations, but can be added.